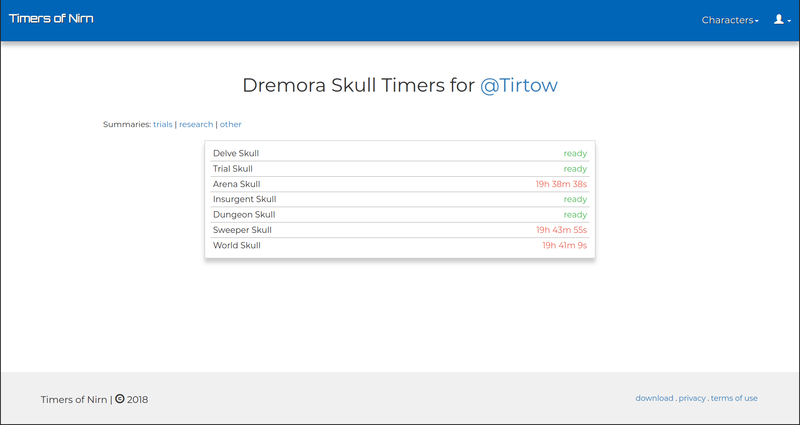 TimersOfNirn now keeps track of your hireling timers and Dremora Plunder Skulls! 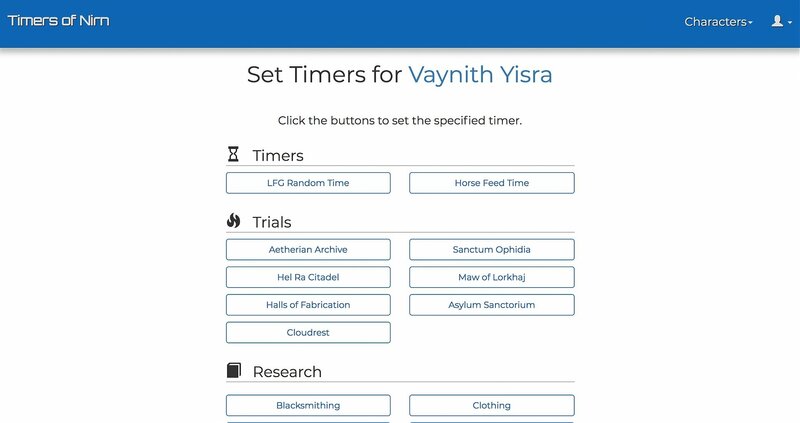 TimersOfNirn is a site paired with an addon that allows tracking of the various timers in the Elder Scrolls Online (horse feed, coffer times, research, etc...) from outside the game. You just need to create an account. PC/Mac users can download the client/addon and use the client/addon to automatically update their timers with the site while they play the game. 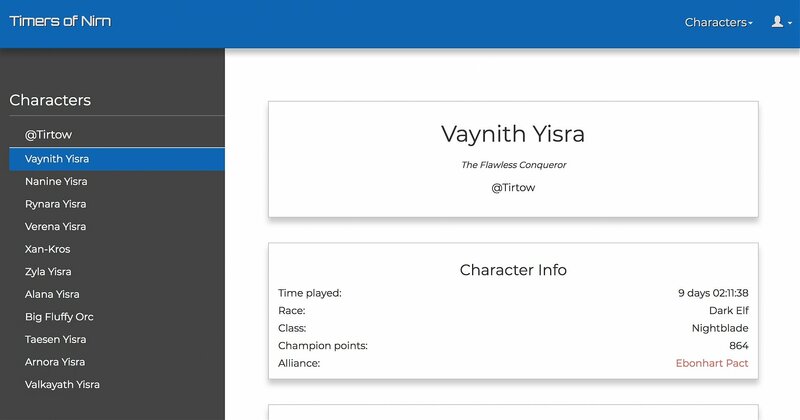 Since console users do not have access to addons, they can create characters on the site and set the timers for them there. Once you have the addon installed, just play the game as usual. 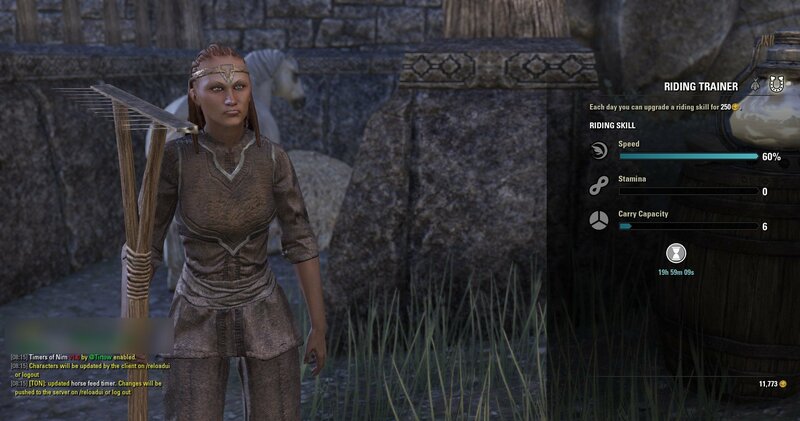 The addon will update your timers for your characters when they change. 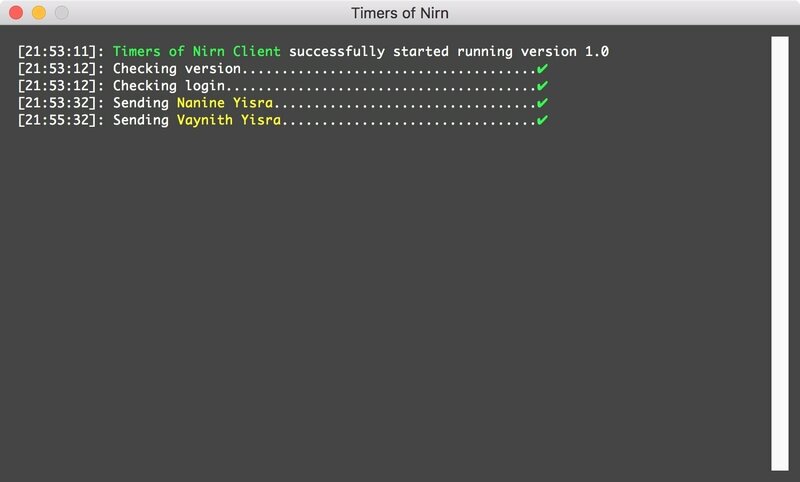 The client will send the updated timers to the site when you run it and will automatically send updated timers to the server when you log out of a character or /reloadui if you leave the client running while you play. The site also provides summaries of all timers allowing you to see the timers for all of your characters together. 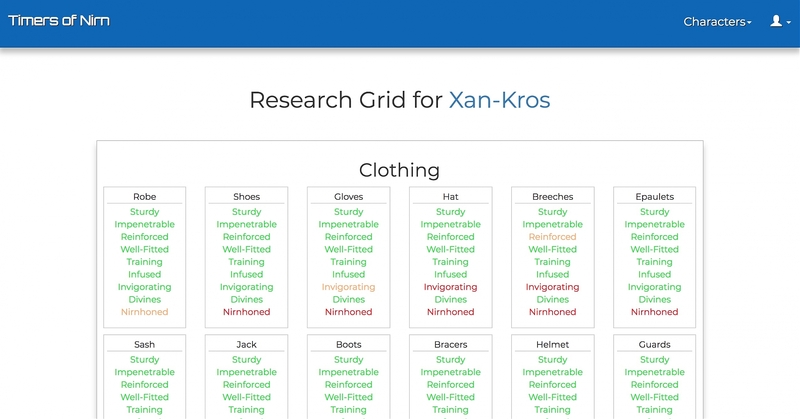 The site also provides a grid showing which traits a character has researched. Hi, good idea but why is this addon size 18mb in total? Is your source code public and are we able to download and compile our version on our selves? Thanks for the great addon, its quickly becoming among my favorites. I'm here to third the hirelings timers too! Those are still mysterious to me. Thanks for adding the Dremora Plunder Skulls, that was a nice touch. I also would echo thats its an awesome addon as well. It would be nice if we could view inventories, view timers or important events all from offline. Last edited by Assassin AKA Talon : 06/22/18 at 01:22 AM. Thank you! Both hirelings and writ timers are on the todo list I decided not to focus on those initially since they reset at a specific time each day unlike horse feed, LFG random, etc. what about also offline tool like that? Thanks for the suggestion. Right now my plan is to have the client just send the updated timers to the site and have the site display all the information. 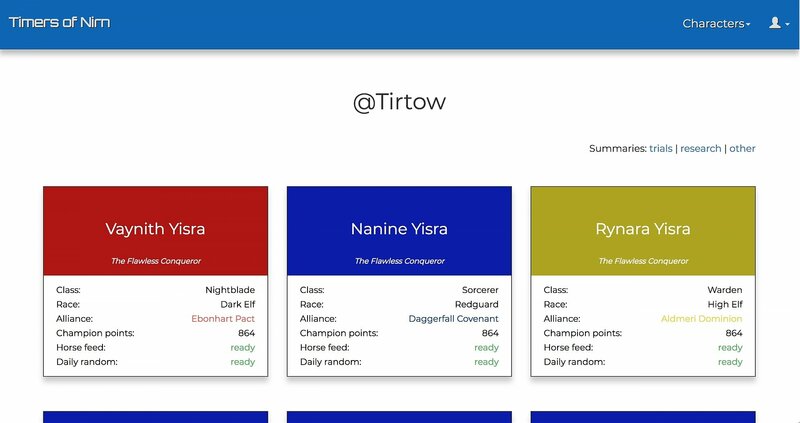 Adding some additional functionality to the client may be a future thing I look in to.